Brent from HardOCP had some quality time with Intel's Core 2 Quad processors to find out how multi-core processors improve gaming. For their test they used Supreme Commander in Windows XP and Vista, this is one of the first games that features out-of-the-box multi-core processor support. As expected, this game takes good advantage of multiple cores. HardOCP mentions scaling the cores of their Core 2 Duo in Supreme Commander yielded positive results. However, they were disappointed with the performance of Windows Vista. This operating system supposedly has better support for multi-core processors but scored much worse in the benchmarks. What we discovered immediately was that performance was much faster under Windows XP. It was at the level where we could now run the game with higher in-game settings on dual and quad-core. It is quite clear as can be seen from our highest playable settings evaluation and our apples-to-apples tests that Windows XP is simply faster. However, the same pattern of core scaling emerged that we experienced under Windows Vista. Single-core was still unplayable, dual-core was much more playable, and quad-core delivered the best experience with noticeable improvements. Task Manager however showed us that Windows Vista is actually being more efficient with all four cores than Windows XP. We found that overall each core was being utilized more than under Windows XP. 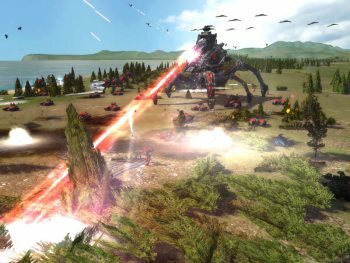 Therefore Windows Vista may very well be taking better advantage of multi-core CPUs in Supreme Commander, even though the performance is overall generally slower. Generally we should see around a 10% decrease in performance with Vista in games compared to XP all things being equal. Unfortunately, all things are not equal just yet. Current NVIDIA Vista drivers are very immature in terms of performance and possibly stability. Remember the crashing to desktop problem we mentioned earlier in the evaluation? It is quite possible the driver is simply holding back performance under Windows Vista at this time.